In October I spent a wonderful afternooon in the company of the young Schumann Quartett in The Robert Schumann Hall of the museum kunst palast. These four musicians range in age from just 21 to 28. Their youth and uncomplicated nature filled the stage which we were invited to share with them. We were treated to two pieces which were light and totally enchanting so that we, the journalists and photographers, were quite simply hungering for more when they finished playing for us. I eagerly await their first full performance in the Hall on Sunday 25th October. The quartet then went on to giving us a real insight on the life of a young musical family of this incredible standard. 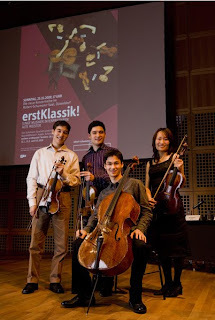 The Schumann Quartet comprise of the half German-Romanian, half Japanese Schumann siblings Erik, 1st violin, Ken, 2nd violin, Mark, 'cello and the charming Japanese Ayoko Goto, viola. All study or have studied at the Cologne Academy of Music and already have a wealth of experience behind them. Erik, the oldest brother is an established soloist of world-wide reputation who has been provided with a violin of Stradivarius from around 1722. After the press conference I asked Erik, the older brother, how his English was. OK he modestly repiled. His friend next to him assured me it was more than ok, so I asked him if he could speak a few words especially for the RhineBuzz community. He willingly said yes as I explained to him who you all are and what RhineBuzz is. We will meet Erik Schumann before the concert at 3.20pm. After our talk with him we can either visit the museum or spend time in the cafe until the concert begins at 5pm. RhineBuzz at the Robert Schumann Hall will happen on Sunday January 31st. The Robert Schumann Hall is in the basement of the museum kunst palast which is at the end and to the right of the Ehrenhof where the NRW-Forum also is. The concerts will be unusual in that the young quartet will introduce the pieces that they play themselves and will offer anecdotes and brief demonstrations on the different styles of what they play. It will, without a doubt, bring chamber music closer to those that wish to know more in a casual and lighthearted way. I am really looking forward to January 31st 2010. It goes without saying that would be superb if we could bring as many of the international community to this international quartet and I know that we will be witnessing a concert of extraordinary magic and the beginning of fabulous careers for these gifted young people. If you would like to join us please send an email to mkp@rhinebuzz.com or you can buy your tickets directly from the box office at the Tonhalle. Excellent seats (€18) have been reserved for Caroline West until 24th January.